Now what?! That’s what many of us ask when looking into the face of a newly adopted dog. This book has the answers, from how to handle home-comings, what to do (and not do) the first day, week and month, why older dogs still need to be house trained the minute you bring them home, and why it can take time for some dogs to bond with you. Every puppy is a new dog, BUT not every new dog is a puppy. Bringing home a mature dog requires faith and patience, and you can count on McConnell and London to be there with you every step of the way. Included is a summary of common behavioral problems like separation anxiety, house training, chewing, resource guarding, fear-based behavior and trouble between dogs along with an extensive resource section on where to find more help if you need it. Many buyers have purchased multiple copies and donated them to their local shelter or rescue group. We say “Woof Woof” to that! Click here for fundraising ideas and to see how others are helping support local shelters and humane societies. a loving and beloved member of your family." "If you've decided to adopt a furry homeless stranger, this book is your perfect resource. practical, accurate advice so you can avoid common mistakes and spark a life-long friendship." "At last, a practical, concise guide for welcoming home your adopted dog. This book and your new four-legged family member—the perfect match!" "Giving an animal a second chance at a forever home is truly a special thing. This book is a wonderful resource for anyone considering adopting a dog into their family." "At last animal shelters and rescues have a reasonably priced and well written book to send home with adopters. 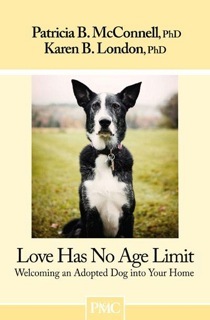 Love Has No Age Limit is easy to read and covers everything the new owner of an adult dog should know before and after they bring their new family member home to ensure a successful transition. HAWS will be encouraging all of our dog adopters to obtain and read a copy of this book."